Think your Mac computer is safe from viruses? How about the recycle bin? Think whenever you empty it you’ve forever deleted files? Then there’s private browsing; think you can surf to any Web site on your company computer and never get in trouble? If you’ve answered “yes” to these questions, then you’ve fallen for three of the most common technology myths. 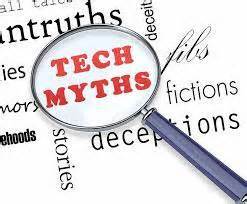 Caroline Moss, a writer with Business Insider, recently covered a number of the more widespread technology myths. One of the most persistent? The belief that Mac computers are immune to viruses. The reality is that they’re not. Now that Macs are gaining popularity, you can bet that a growing number of hackers are lining up to target their own viruses at Apple’s operating system. Moss also explains that emptying your recycle bin doesn’t permanently delete the files in it. Even after emptying your bin – or your trash – you leave fragments of files which can be retrieved later with some work. Then there’s private browsing, that is less private than you may think. Just because you’ve told your browser to go incognito doesn’t mean that the Web sites you visit are not tracking details from your stay. And when you download files while in private-browsing mode, these files will remain on your computer after you return to regular browsing mode.